How many times do you ever look close enough at the person checking you out in line to know what color eyes they have or how often do you remember what your spouse wore to work? We’re all busy-really busy. Unfortunately this makes us easy marks for criminals who place skimming devices on ATM machines. We’re in such a hurry to get our cash and get on our way that we don’t notice some of the subtle signs that can indicate trouble. 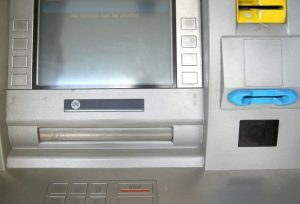 ATM skimmers need your card information and your pin so they try to place fake card readers over the top of the original card slot to gather your information when you swipe or insert your card. They then will either install small (and I mean really small) cameras on or near the ATM or they’ll install a fake keypad over the original to gather your pin. Don’t you hate feeling suspicious all the time? When it comes to ATMs, you should feel suspicious. Always pay attention to objects mounted on the ATM or located close by. A pinhole or off-color piece of plastic could give away the camera’s hiding place. Look for graphics that don’t align correctly, colors that look off or the placement of objects that seem odd like in the photo below. Notice how the arrows pointing to the yellow card reader are partially covered. An ATM would never be constructed this way so this screams ATM skimming. Scary stuff. But if we just stay diligent and take a few minutes to really observe before we insert our card, we’ll be a whole lot safer and who knows, we may even begin to notice the little things in life.